When dark chocolate meets ancho chile, it’s a happy taste match. This recipe started with a tub of leftover sour cream in the fridge and a yen for something with dark chocolate. Come fall, I crave the flavors of Mexican chocolate, with its notes of ancho chile and almond. The sour cream was a just a nice bonus that adds richness to the cake. The recipe also features a couple of my baking secret weapons: ghee and whole wheat pastry flour. Of course, ghee is a common component of Indian cooking, but it also adds sublime depth to just about any baking recipe that calls for softened butter. Whole wheat pastry flour, which you can find in the baking aisle at most supermarkets, is a dead-easy way to boost the nutrition in a recipe without sacrificing texture. Try subbing it for some — or even all — of the all-purpose flour in a recipe. A dusting of powdered sugar is just right for this simple cake. And if you want to get fancy, add a pretty lil’ shape. Just download a pattern from the Internet (like the basic autumn leaf I used here), cut it out, and — voila! — you’re a regular kitchen MacGyver. 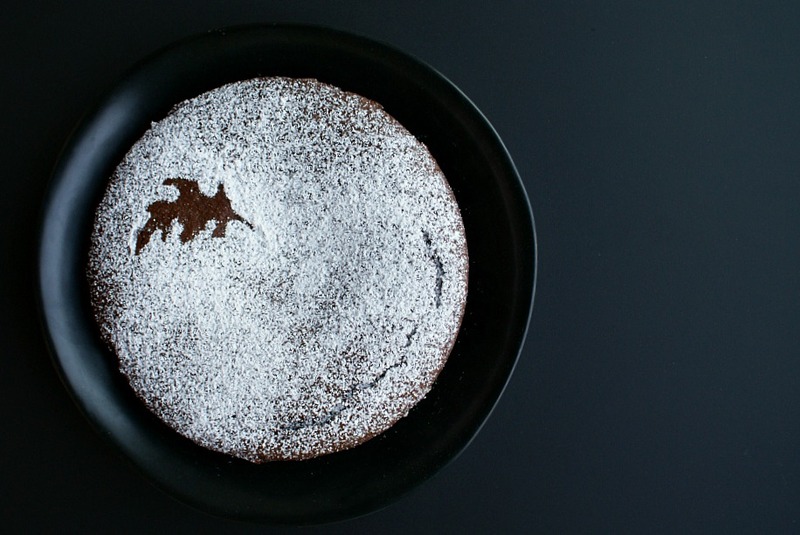 This simple dark chocolate cake doesn't need a lot of dressing up -- just a dusting of powdered sugar and you're good to go. Butter a 9-inch round cake pan. Line the bottom of the pan with parchment paper (here's an easy chef's trick to do that). Lightly butter parchment paper. Dust pan with 1 tablespoon all-purpose flour. Sift together remaining 1/2 cup all-purpose flour, whole wheat pastry flour, cocoa, baking powder, baking soda, chile powder, cinnamon and salt. Place ghee in a large bowl. Beat with a mixer until light and fluffy. Add granulated sugar; beat until well combined. Add eggs one a time, beating well after each addition. Beat in chocolate. Add flour mixture alternately with sour cream, beginning and ending with flour mixture. Beat in vanilla and almond extracts. Pour batter into prepared pan. Bake at 350° for 25 minutes or until a toothpick inserted in the center comes out with just a few crumbs clinging to it. Cool in pan on a wire rack for 10 minutes. Run a knife around the edge of the cake. 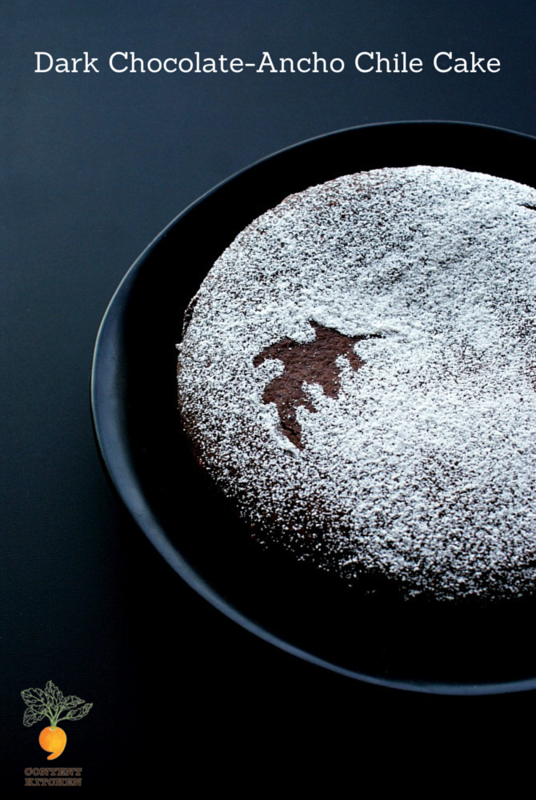 Remove cake from pan; cool completely on a wire rack. Before serving, sift powdered sugar over the top of the cake.